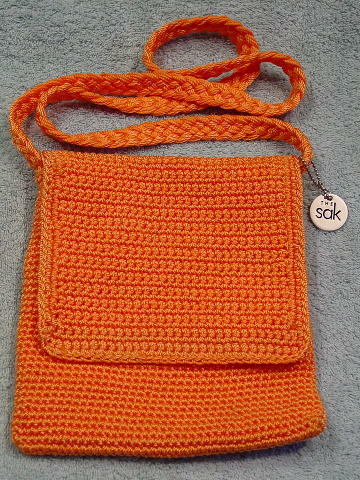 This The Sak woven purse is in a tangelo-orange color. 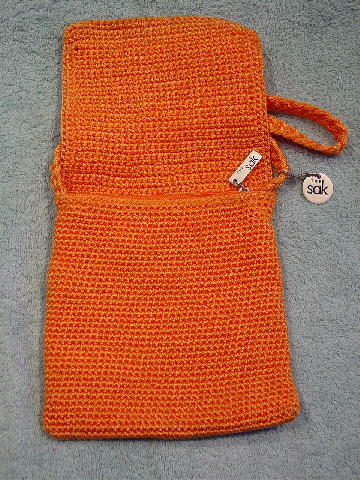 It was handmade in Indonesia and has an interior cantaloupe colored fabric lining with an interior zipper compartment and an anodized metal tag inside that says The Sak. There is a side to side top zipper with a metal pull and an anodized round metal disc attached to the strap which also says The Sak. There is a 41" long woven shoulder strap. The front flap is 5 1/2" long. It was used in a department store newspaper ad.